We've really taken our time to achieve our goal of creating the very best race bike around. Every curve has been contemplated and every design decision debated in order to sculpt and hone the Whippet into an efficient lean mean racing machine. We invested significant time and money into developing our own tooling to develop a frame exclusive to us. This is not a cheapo generic open mould design. Based on our tried and tested, award winning Scandal geometry, this Whippet knows its way round a race track. A long top-tube and low front end create an out-and-out XC 'head down and arse up' riding position. What's more the Whippet's race tested in real world conditions and has even won World Cup points! We've really tried to take tube shaping to the next level on this frame. The Whippet uses high modulus unidirectional 3 piece Monocoque Carbon construction. By making a single lay-up for the entire front triangle, the bonding of lugs and tubes is eliminated resulting in increased strength and stiffness. What's more the carbon can be layered in key areas to 'tune' the ride and feel. For example the heat-tube and chain-stay aren't just styled, but shaped for front end stiffness and rear end compliance. Generous mud clearance allows plenty of room for fat tyres and the Whippet's smooth flowing lines create less 'shelves' for mud to cling to. All leaving you sludge free to sprint to the finish line. No-nonsense UK specific design features are a hallmark of all our bikes and the Whippet is no different. Like most dogs it's more than happy having a good old roll about in the dirt! One of the key benefits of Carbon construction is the ability to avoid redundant overlapping structures that put unneeded material and weight in the wrong places. Using Carbon meant we could keep things light but durable, giving a much better stiffness to weight ratio than using alloy. By using a BB92 press-fit bottom bracket we were able to make the BB area both Wider and stiffer giving more efficient power transfer. This is ideal for those new-fangled 2x10 Chainsets, don’t worry though, it'll still be just as happy with good old 3x9. 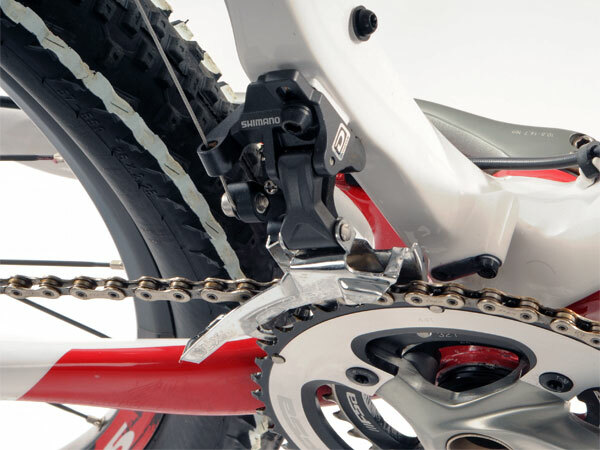 We know you wouldn't want to damage that beautiful frame by sticking a big old front mech clamp onto it. With that in mind we made sure you can fit both high and low direct mount front mechs in either Shimano or SRAM flavour, whatever you prefer. We recommend high mount to give the best mud clearance, increased adjustability and best choice of chainrings. Fancy switching to singlespeed for the winter? Not a problem with a Whippet. Run vertical dropouts for gears or horizontal for singlespeed and hub-gears, the choice is yours. 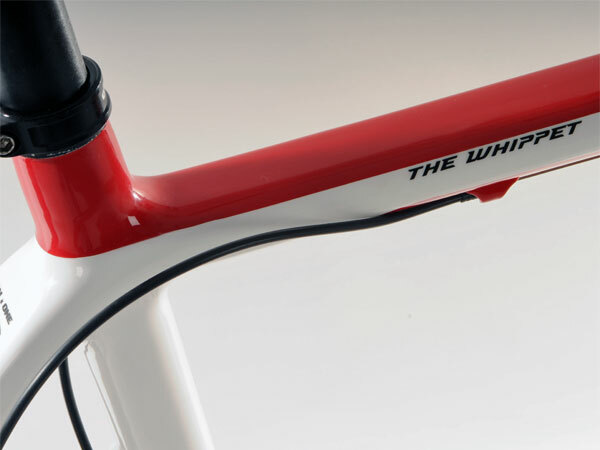 The Whippet's advanced chainstay profile is shaped to include a power bulge to increase stiffness and compliance in the rear end. All useful to keep things tight yet comfortable during your next 24-hour endurance event. We went for 31.6mm seat-tube in homage to the old Klein race bikes we loved back in the day. Plus an oversized seatpost helps to keep things stiff and responsive and we absolutely hate it when you have to sniff about for ages to find a seatpost that finally fits. Convinced? Click here to buy a Whippet frame, or click here to buy a complete Whippet bike, now in stock in all sizes. Howdy! I've got an "old" Whippet with a standard 2*10 drivetrain. Is it theoreticallay possible to convert it to an Alfine (8 or 11) hub? Hi, I'm interested to change my old frame with carbon Whippet or 456. I do more xc, less paths. My fork is 100mm. What do you suggest? Also, some more questions: -will my crankset Fsa afterburner 3x10 with megaexo bottom bracket fits? -My height is 182cm, my inseam is 86cm, so the frame size is 18'' or 20''?? Thanks! Hi folks, I´m thinkink of buying the Whippet carbon frame. I´m 172 cm (about 5 feet, 8 inches) tall with 81 cm (32 inches) inseam, so, according to your sizing guide, with my body height, 16 inch frame should suit me perfectly, but if considering my inseam, I´m on the border line between 16 and 18 inch frame. Which size would you recommend me? ????????????, ? ???? ? ??????. ???? ???????? ???? 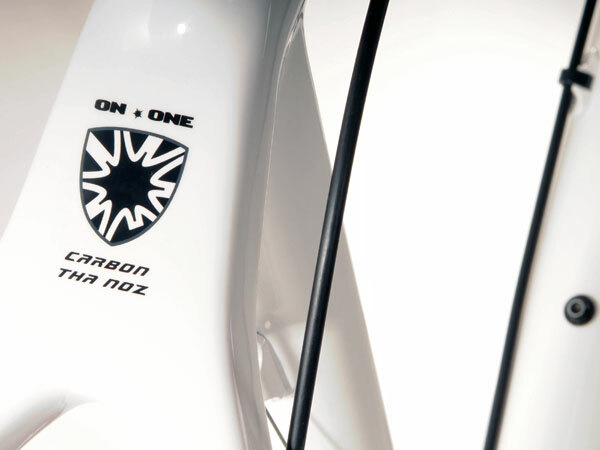 On-One Whippet XC Carbon 16". ???????? ?? ??? ??? 3?9? ???? ??????? ?, ?? ????? ??????? ??????? ????? ?????? ???????? ???? ? 2 questions: a) have 33.5" inside length what size do you recommend b) do you do fitting of headsets I live in DOncaster and feel fine with rest but not headset? Steven, I'd recommend an 18". Put it this way, I'm pretty much the same size as you and I'd be buying an 18". Hi darren, we certainly are able to offer bikes on the Cycle to Work Scheme, perhaps give our customer service guys a call on 01709 386666 for more details? With regards to the sizing, I'd probably recommend a 16" for your height. are you registered for the cycle to work scheme? I'm in N.Ireland and woould be interested in one of these through the scheme. Also im 5ft9" - 5ft10" what size do you recommend? Hi Paul, we reckon you'd probably be best with a 16". Hi Mick. Best we can do on the system is an upgrade to FSA XC300 wheels for an extra £100. We do have XT wheels in stock, but as these are centrelock and the brakes come with 6-bolt rotors you'd need to give us a ring to work out the upgrade price. To be honest the Deore hubs are actually pretty good IMHO. im thinking of ordering one of these in the next few weeks. only thing thats bugging me is the hubs, why only deore and not slx or xt? Hi dave, 2x10 builds are in the pipeline, we are sourcing componentry at the moment. Perhaps sign up for our email newsletter for the latest availability and pricing info? I'm really tempted by this at the moment. Any plans for a 2x10 build being made available, the frame seems ideal for it.